If all goes well, residents of downtown Manhattan and visitors to the area will get the holy grail of free WiFi, but from a trash can! Yes, free WiFi from a trash can. 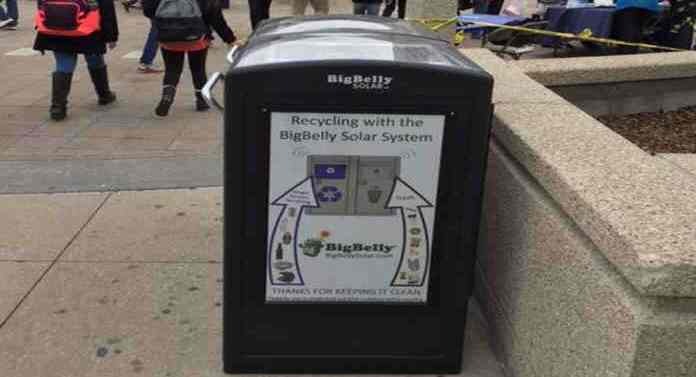 The brainchild of Newton (MA) trash management company Bigbelly, the plan is to install WiFi units into its solar-powered ‘smart’ trash bins. Bigbelly partnered with the Downtown Alliance on a pilot project last winter to create wireless hotspots by installing WiFi units into two ‘smart’ trash cans. The goal was to examine the quality of the WiFi signal and the number of people who could connect to the wireless hotspot. Apparently, the results of the pilot were promising. The WiFi bandwidth speeds came in 50Mbps-75Mbps, enough for a small business. A big plus with the Bigbelly trash cans is that since since they’re on street level, there’s no interference from New York’s towering skyscrapers. Whether the WiFi from a trash can project goes beyond the initial tests depends on grants, sponsorships, more pilot tests and the number of Bigbelly ‘smart’ trash bins in the city. While Bigbelly has applied for a grant from NYC Mayor’s Office to convert several hundred NYC trash bins into WiFi hotspots, the competition for funds is intense and there’s no guarantee it’ll be successful. Also, Bigbelly trash cans are mighty expensive and reportedly cost about $6,000 per trash bin compared to $100-$600 for a regular city trash can. Given the high price tag of these ‘smart’ trash bins, I wouldn’t get too excited about seeing widespread installation of WiFi units in NYC trash cans any time soon. Downtown New Yorkers and visitors to Chinatown and other sights in lower Manhattan would be better advised to explore other options for their mobile Internet fix.